NEW: ULTRA-FAST WINDOWS THUNDERBOLT™ DRIVER FOR SUB-MILLISECOND ROUND-TRIP LATENCY! Needless to say Goliath HD is armed with the full Antelope Audio arsenal of hardware-based FPGA FX. These include the most authentic and realistic zero latency Vintage EQs, Compressors and guitar amp & cabinet models on the market. Use them for real time tracking or mixing and easily save presets with your favorite setups. Those can be easily recalled or shared with other studio facilities, which are also part of the global Antelope Audio family. 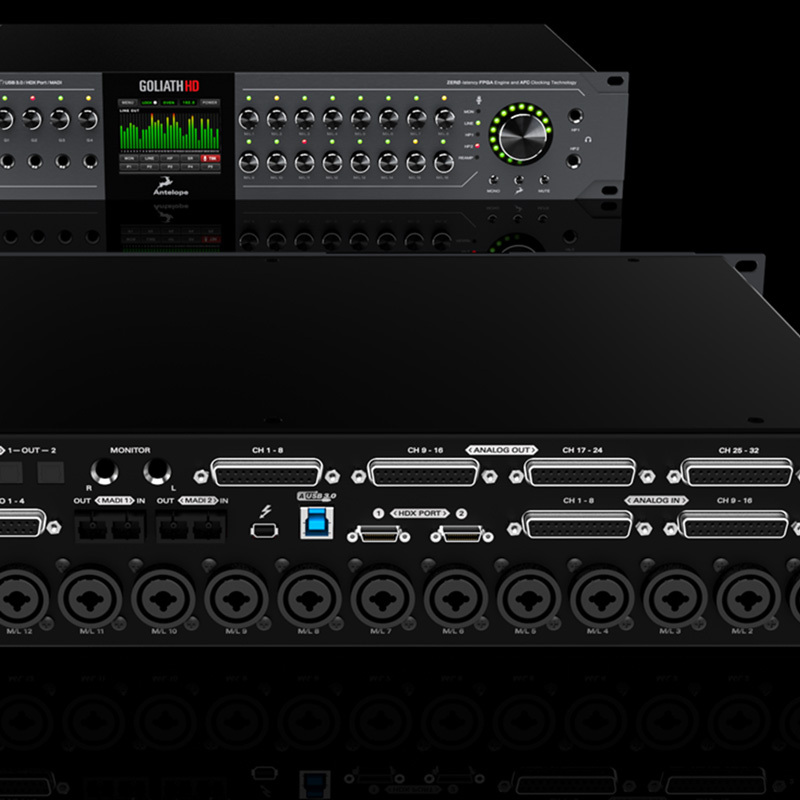 Goliath HD is a 64-Channel interface that can be used with Pro Tools HD or Native DAWs via second generation ThunderboltTM, USB 3.0 or via 2 MADI connections, which are compatible with MADI to Dante Bridge products. Coming with extensive I/O options, featuring 16 Accusonic mic preamps with individual volume controls, 32 analog ins with 124dB of Dynamic Range, 32 analog outs with 129dB of Dynamic Range, plus mastering grade monitor outputs, featuring new technology that boosts dynamic range to a spectacular 132dB. Goliath HD comes with 8 instrument inputs, 2 transformer re-amp outs, integrated Talkback mic, 2 headphone outs and a pair of analog inserts. And if this wasn’t enough, the descendant of the mighty Goliath offers also AES, MADI, ADAT and S/PDIF connectivity. 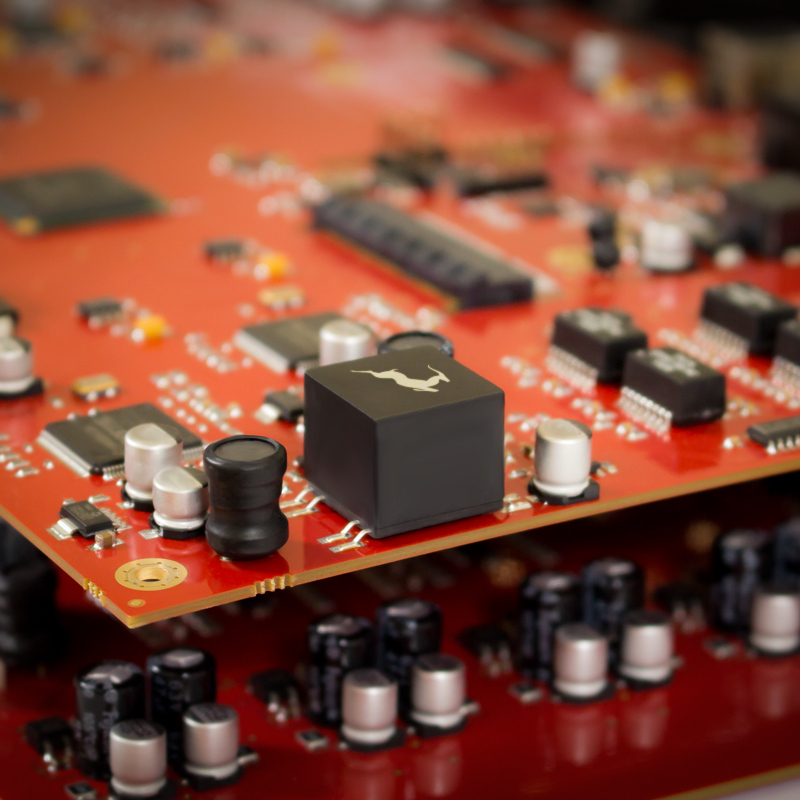 FPGA offers a whole new level of real time performance and sonic excellence. The platform is taking advantage of real hardware circuitry and component modeling, allowing engineers to track a vocalist with a zero latency headphone mix, including reverb; record a guitar part with proper feel & tone, using onboard amp and cabinet FX. Capturing a full drum kit is also brought to another level with up to 16 mics using the industry’s best new Microphone and Mic Preamp technology, all in realtime. With Antelope’s proprietary HDX Delay Compensation, any analog or digital input can arrive in Pro Tools HD sample accurately in the timeline. No other interface on the market offer this level of perfect integration for digital sources to Pro Tools HD software. The Antelope Audio Real-time FX, zero latency independent software mixers and routing matrix with two alternative views are the perfect compliment to Pro Tools HD studios, which have come to expect maximum power at their disposal. 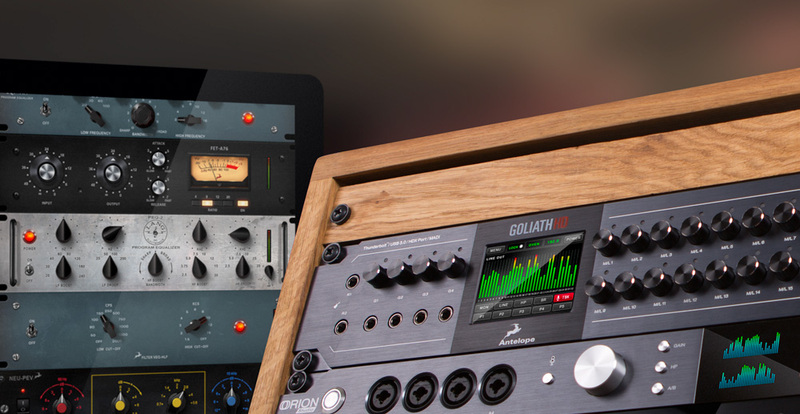 Goliath HD, however, is compatible with any DAW on the market making the device the heart and soul of the highest tier audio facilities around the world. Our newly introduced full Session Presets are the perfect match for the complex and large-scale setups and projects Goliath HD was designed to handle. By offering both HD and USB 3.0 modes, engineers can now accommodate producers and their laptop projects and integrate them into their existing HD setups by easily switching between HD and our low latency Thunderbolt™ Gen2 and new USB 3.0 modes. Goliath HD guarantees quiet operation even in the most demanding control rooms. Don’t be surprised if soon expensive machine rooms become a thing of the past. Another reason why Goliath HD sounds like no other interface on the market is because of the world-renowned Antelope Audio Acoustically Focused Clocking (AFC) jitter management technologies it features. With over 20 years of history in digital clocking behind us, we backed the Goliath HD up with all OCX HD and Trinity sounding audio clocking. This unbeatable sonic detail and precision, combined with analog authenticity will bring your sound to the realms of hi-end audio. Now you can also spread this perfection across your whole studio as BNC connectors are available for use as Loop Sync, standard Word Clock I/O and the Antelope Audio 10M atomic input. Michael “Fish” Herring. An accomplished musician, Fish toured the world with artists from the unknown to the legendary. He has also appeared on records for artists such as Mariah Carey, Tupac, Nas, LeAnn Rimes, Siedah Garrett, Celine Dion and other superstars, as his discography continues to grow. Thunderbolt: 1x Thunderbolt port. See our Thunderbolt FAQ section.